Celebrate National Orthodontic Health Month with Us! Posted on October 16, 2015, 6:30 am, by orthoadmin, under blog. 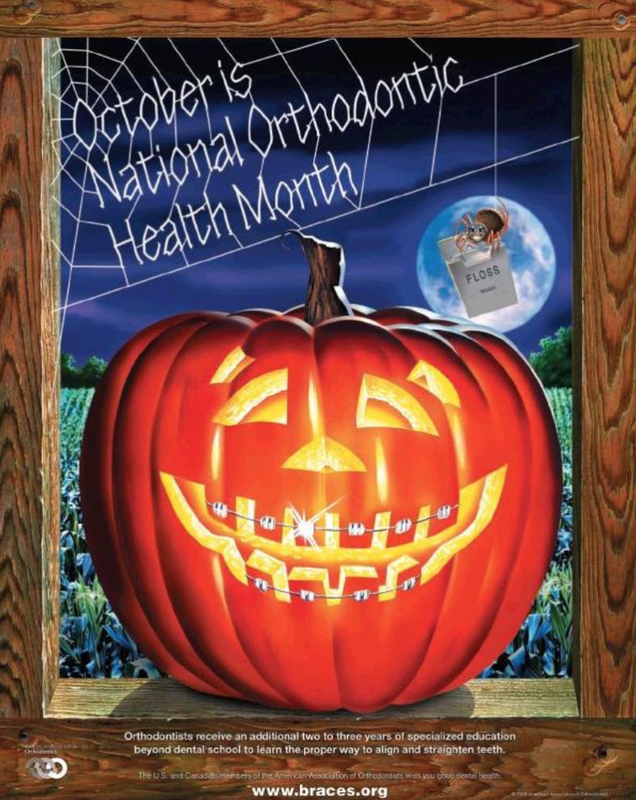 This October, as you celebrate the changing colors of the leaves, the crispness of the autumn air, and all those Halloween goodies, costumes, and parties, we at Orthodontic Arts invite you to join us in another October celebration—National Orthodontic Health Month. Each year, the American Association of Orthodontists designates October as a time to remind everyone about the importance and benefits of orthodontic care, and Halloween time is the perfect occasion to do that. After all, there are a lot of people walking around out there who feel that their teeth look mighty scary! Some people even have fangs—that aren’t part of any costume! These are exactly the kinds of problems that an orthodontist can fix. Drs. Prillaman and Sterne are specialists who’ve been serving our community in the Lynchburg, Bedford, Madison Heights, Farmville, and Keysville areas for years, transforming many a jack-o-lantern smile into a thing of beauty. So, whatever your orthodontic concern is—crowding, spacing, overbite, crossbite, tooth impaction—or even if you just want to speak with our doctors to make sure the aesthetics of your smile and the functionality of your bite are the best they can be, treat yourself to a complimentary consultation at Orthodontic Arts. We serve children, teens, and adults and offer a wide variety of options to customize your treatment plan to your specific needs, including metal and clear braces, retainers, Invisalign and ClearCorrect aligners, palatal expanders, and bite correctors. Are you a little spooked about seeing an orthodontist? No worries. Our friendly staff and doctors, game room, massage chairs, and coffee bar will help make your experience a pleasant one, laying to rest any horror stories you may have heard. If you’re one of the four million children or one million adults in America already in orthodontic treatment*, remember that National Orthodontic Health Month is for you, too. It’s a time to celebrate all you’re doing to improve your smile. Your efforts will definitely be worthwhile! We want to encourage you to stay on track with your orthodontic and dental appointments and maintain good oral hygiene. And as you enjoy Halloween, remember to choose treats that are brace-friendly, like nut-free candies and soft candy bars, sugar-free gum, and peanut butter cups. Avoid foods that are sticky, gooey, hard, or crunchy. If you follow all your orthodontist’s instructions, your treatment will go as smoothly as possible and your mouth will go from monstrous to magnificent! Could there be any treat sweeter than that? « Should You Get Braces?